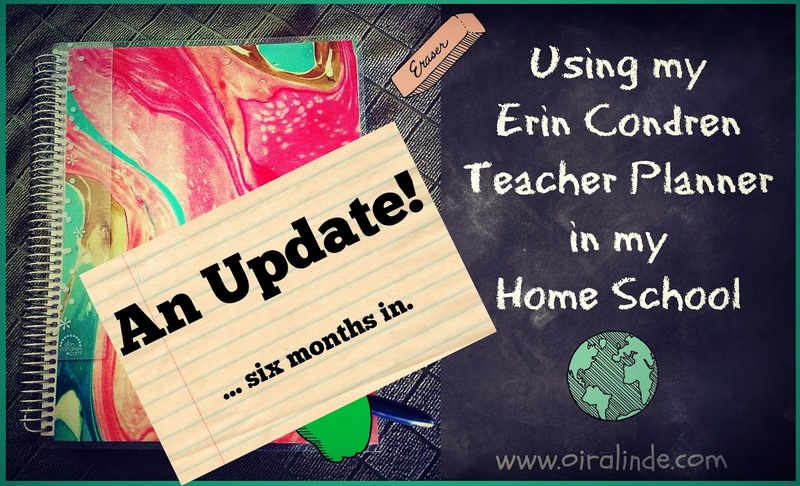 Back in July I shared with you my Erin Condren Teacher Planner and how I set it up for the year to use as a homeschool parent. Today I want to share with you how that is going and whether I am still using it and liking it. I am still in love and using this beauty every day. It keeps me sane and decorating it makes me happy. 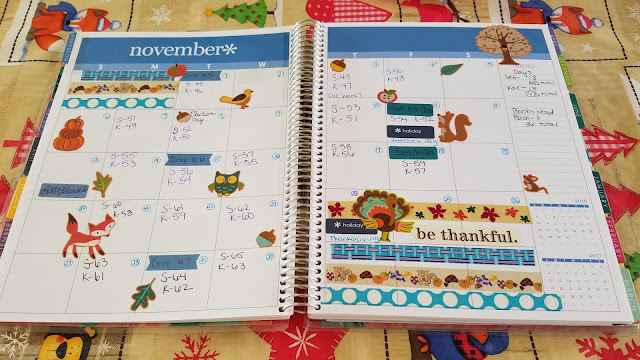 I used to only write in the weekly lesson plans, but lately I have been making them fun by adding stickers and washi. There is no purpose to the decorations besides it making me happy, but I think it looks beautiful and it makes me want to plan more often, which keeps me on top of our school more. My original planning strategy: minimilistic. New strategy: all the washi! Yay, Christmas! 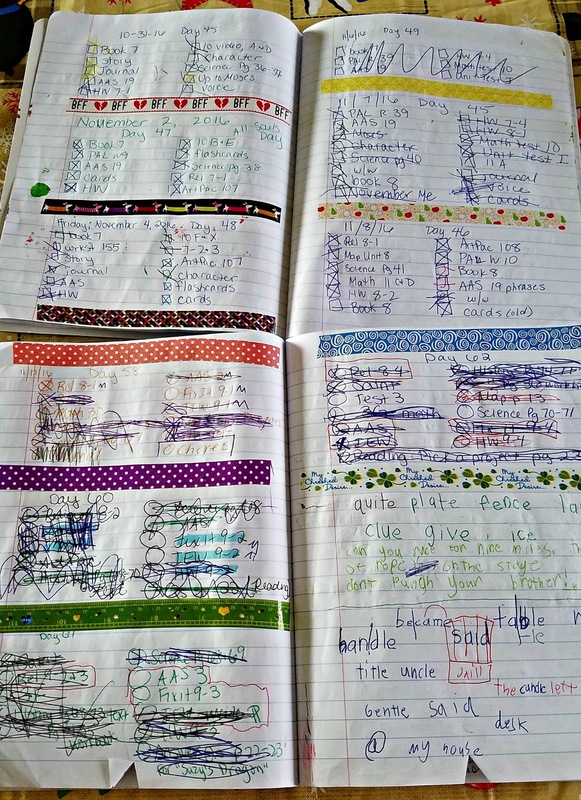 I started to write daily assignments down in notebooks for the kids. That helps them not badger me and keeps my expectations for the day clear. Sebastian is a bit more violent as he finishes assignments. 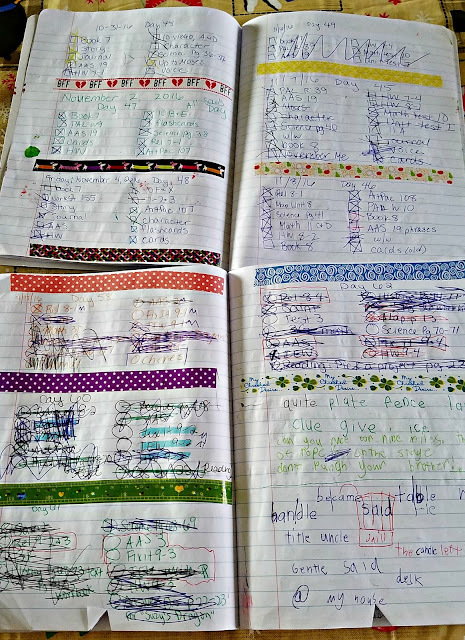 We also work on spelling words in the notebook as well. On the month I notate days of school, field trips, co-op days, art classes, Little Flower meetings as well as holidays. I also decorate like crazy. 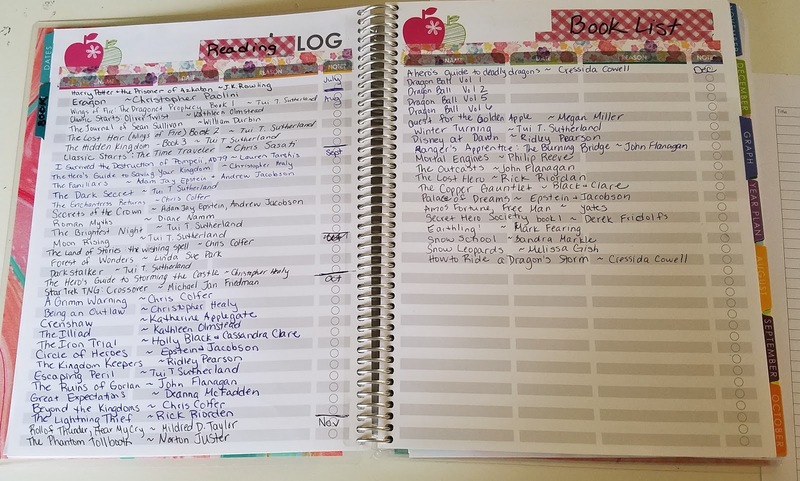 I learned somethinig about my reading log. Next year, I am going to make two columns on each page. Sebastian reads a TON and I am running out of room and it is only December. For this year I am going to be taping in extra pages, but I would rather not do that for next year. 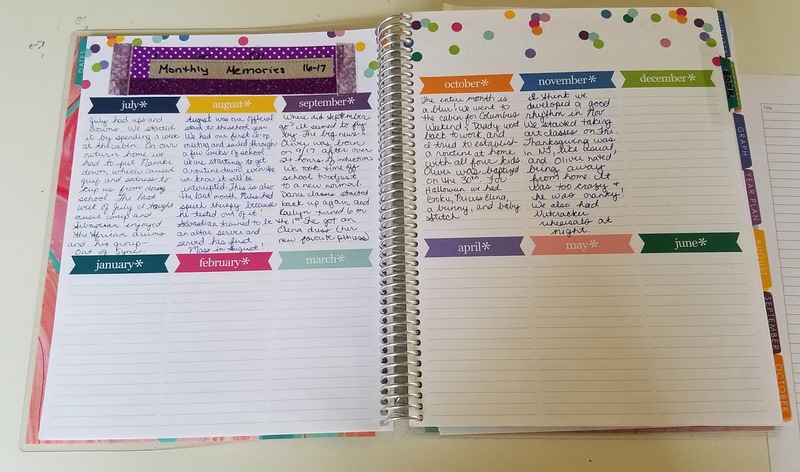 Now that I have a separate memories planner, next year I may turn this into a place to jot down attitudes and behavior during the month. I also keep a list of my co-op contacts and co-op dates where it originally had things for the substitute. 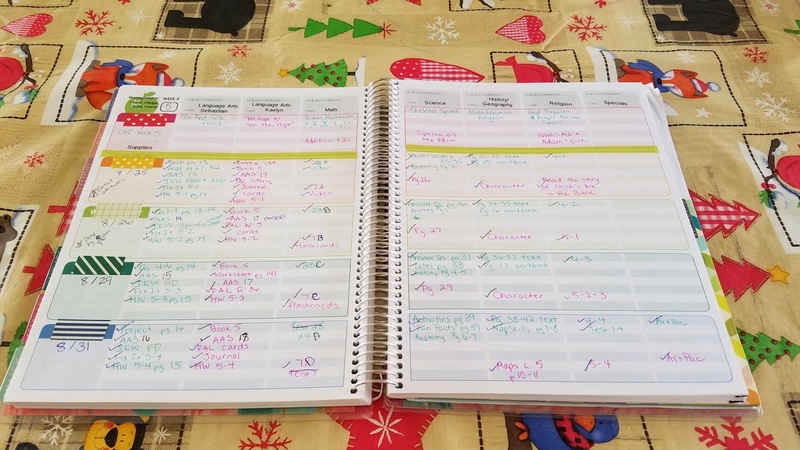 I do use the checklist in the back to write down assignments and *some* grades. I don't typically grade things, but I do grade math tests and I am starting to grade some of Sebastian's work as he begins to mature. 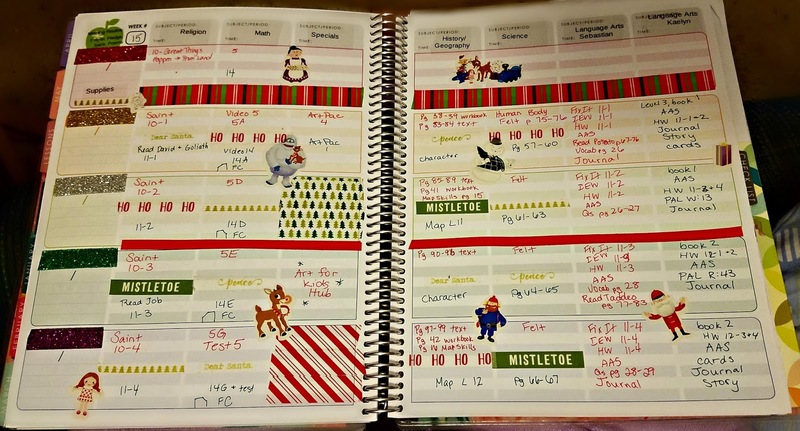 I do love this planner and I am making it work for me. I look forward to getting another teacher planner for next year and changing what I did. There are a few things I could do better and could use differently for next year. I will let you know about those changes! You can get $10 off your first Erin Condren order by using my referral link (I will also get $10 off).